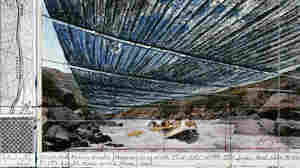 February 18, 2012  The artist famous for works measured in miles wants to drape long, billowing panels of silvery fabric over sections of a Colorado canyon. Not everyone is excited; some residents say art is no excuse for the damage it could cause. 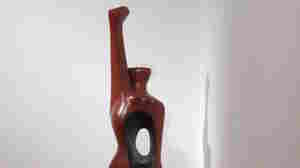 February 12, 2012  In just the last year, 96-year-old sculptor Elizabeth Catlett has had her work featured in exhibitions from Istanbul to Mexico to New York. She broke through barriers of race and gender, yet remains unknown to all but the artists she inspires. February 11, 2012  France has opened a new museum honoring one of the most multi-talented, controversial and too-often-forgotten artists of the last century: Jean Cocteau. He was a poet, playwright, sculptor, painter and filmmaker. Frank Browning reports that it's all on view on the Cote d'Azur. February 5, 2012  Last year, the oil-rich Gulf nation of Qatar quietly purchased a painting by Paul Cezanne for more than $250 million, the highest amount ever paid for a work of art. Rachel Martin talks with Alexandra Peers, who recently wrote about the sale in Vanity Fair. 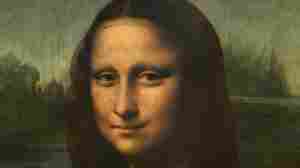 February 2, 2012  Conservators at Madrid's Museo del Prado recently discovered that a replica of the Mona Lisa might have been painted by one of Leonardo da Vinci's pupils. The find provides fresh insight into da Vinci's enigmatic masterpiece and studio practice. 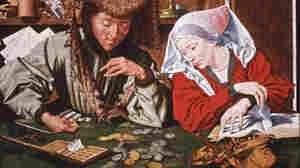 January 31, 2012  With a nod to the current financial crisis in Europe, an Italian art exhibition looks at the often controversial role that banking played in expanding trade and helping usher in the Renaissance. 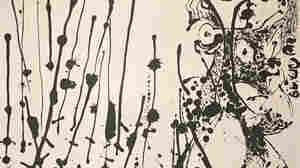 January 28, 2012  Even a century since his birth, American "splatter artist" Jackson Pollock still provokes heated debate about the very definition of art. Was a man who placed a canvas on the floor and dripped paint straight from the can actually creating a work of art? January 27, 2012  Discover the secret life of ice--what makes it cloudy or clear, why cracks form on ponds. Science Friday visited Queens ice sculptor Shintaro Okamoto in his studio and spoke with ice researcher Erland Schulson, of Dartmouth University, to find out why ice is an interesting subject for artists and scientists. 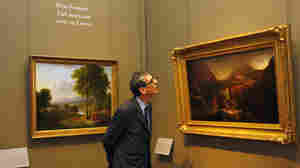 January 25, 2012  The iconic Paris museum has just four American paintings in its huge permanent collection. But a temporary new exhibit is putting the spotlight on early American art, featuring Thomas Cole's dramatic landscape paintings from the early 19th century. January 15, 2012  "I was a drum major for justice, peace and righteousness." That sentence is inscribed on a statue of Martin Luther King Jr. in Washington, D.C. The problem? King never said those words, at least, not exactly. Interior Secretary Ken Salazar has given the National Park Service a deadline to correct the inscription. Host Rachel Martin has more. January 15, 2012  Metropolis II is a giant model of a city with 1,200 colorful little cars zooming at lightning speed around it. 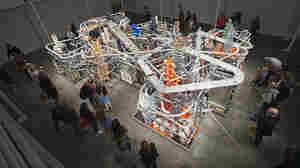 The 10-foot-tall piece basically fills up a room, and accidents can happen at any time. Artist Chris Burden decided early in his career that "movement, performance in a certain sense, was the core of sculpture." 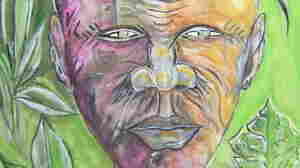 In Haiti, Where Does Art Fit In? January 12, 2012  With tens of thousands of Haitians still displaced and living in tent cities, some might consider art a luxury few can afford. But curator Diane Ford Dessables is working with venues in the U.S. to sell the work of Haitian painters. The sales go to the artists and to help rebuild an art school. Host Michel Martin talks with Dessables. December 27, 2011  At a time when the art world was still dominated by men, Frankenthaler's canvasses earned the respect of critics and influenced generations of artists. One of the major abstract expressionist painters of the 20th century, Frankenthaler died Tuesday at her home in Connecticut.